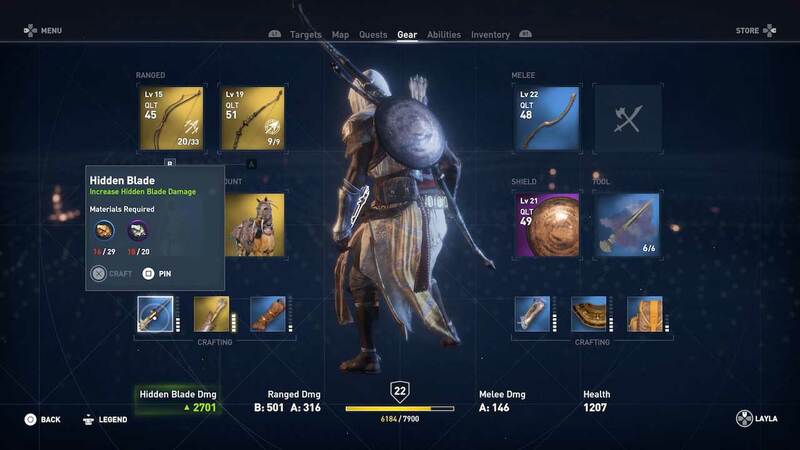 Assassin’s Creed Origins has a new weapons and equipment system. You’ll be glad you took the time to understand it the first time the bounty hunters come breathing down your neck. 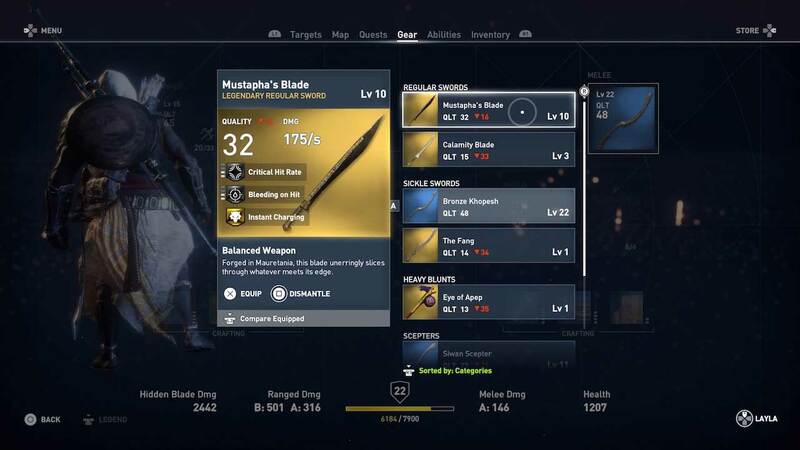 This Assassin’s Creed Origins guide page intends to explain the inventory system in full so you know how to get your hands on the best weapons, which ones you should hold on to, what to do with your old gear, what and when to upgrade, where to find silica or carbon crystal, the pros and cons of the different types of weapons and more. If you spend time looting the environment and completing side quests you’ll soon find you have loads of equipment. It can be difficult to see which weapons you should be using at any given time, and which ones you can safely offload. Take a quick look over this before you dive into Assassin’s Creed Origins – it’s more of an RPG than you might be expecting, and with the right gear you’ll have a much better time. Need more help> Check in with our Assassin’s Creed Origins guide for more tips, such as a our picks of the best Hunter, Seer and Warrior abilities. Blue weapons and shields are common and have one attribute. They dismantle into common materials. Purple weapons and shields are rare and have two attributes. They dismantle into rare materials. Golden weapons and shields are legendary and have two to three attributes. Don’t dismantle or sell them! Until you get close to endgame and have all your other equipment upgraded, dismantle your unwanted weapons and shields rather than sell them. You don’t really need money except to upgrade weapons, but crafting materials can be more of a chore. You’ll be glad to have a big stack of them when you want them. Don’t think twice about dismantling or selling blues and purples, but never dismantle or sell legendary weapons and shields before endgame. These are really infrequent finds and you can upgrade them once you hit endgame and stop finding trash loot at higher levels. Just hang onto them for now, and consult the upgrades section below. 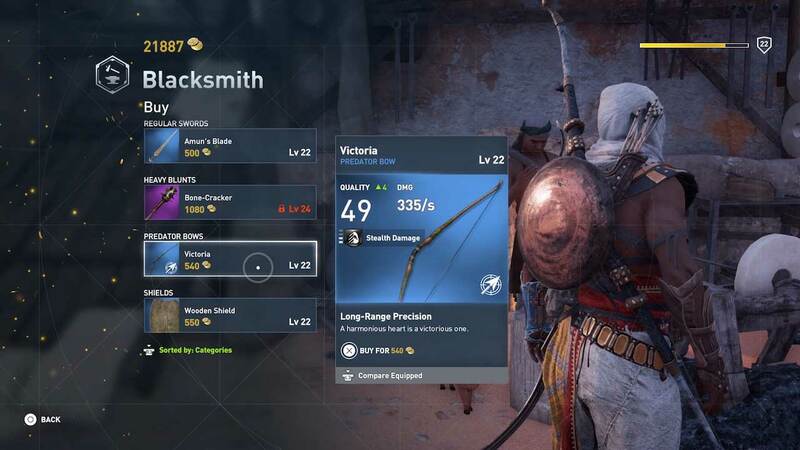 The best source of legendary weapons and shields in Assassin’s Creed Origins is papyrus puzzles, followed by side quests, followed by treasure boxes in tombs, forts and bandit camps. With so much loot, it can be difficult to tell at a glance which weapon you should be using. Each weapon is labelled with its DPS (damage per second), but since each category is used differently, the quality level is a more helpful measure of which one is best. When it comes to melee weapons, if you’re comfortable using every category of weapon (see below), you can just equip your highest quality weapon, or the best weapon in your favourite categories. On the ranged side of things, it’s best to hold on to two bows – one for ranged sniping in stealth, and one for when things kicks off into open conflict. More on that in the weapons category section below. If you have two weapons of the same quality, look to their rarity. As outlined above, the more rare a weapon is, the more attributes it has, and these can make a big different. Our favourite weapon attributes are adrenaline build rate up, instant charge, bleed on hit and poison on hit. Looking at the attributes will help you determine which of two otherwise equal weapons is best. Just once more for the record: never dismantle a legendary weapon or shield. You’ll want something with three attributes when things get tougher towards the end of the game! This segues neatly into upgrades. If you have an amazing legendary weapon you love using but it’s dramatically lower quality than whatever rubbish blue you’re carrying around, consider upgrading it. It’s very easy to upgrade weapons and shields: just visit the blacksmith in any town and select upgrade from the vendor menu. You don’t need any crafting materials – just a wad of drachmae. The higher the level you want to bring your gear to, the more expensive the upgrade. It can get pretty pricey at high levels, and so we suggest saving all your cash and upgrading your favourite weapons when you really need them, rather than every few levels. Until you start facing down really tough enemies, any old weapon will do. One good strategy is to upgrade a favourite legendary weapon or two right before you go off to challenge a bounty hunter, since these are some of the toughest fights in the game – even when you’re levelled appropriately. Remember how we suggested dismantling all your unwanted blues and purples? Here’s why: the crafting materials you’ll get from them can be used to upgrade your other equipment. Your breastplate, bracer, glove, quiver, hidden blade and toolbelt can each be upgraded through multiple tiers, eventually reaching legendary status. If you’re a stealth player, the most important upgrade is the hidden blade. At legendary level, the hidden blade does way more damage in stealth attacks against enemies you can’t insta-kill, and will even insta-kill some enemies of a higher level than you. Our favourite upgrade after that is the quiver. Unless you don’t use the bow at all (why! ), whether you play stealth or chaotic, having more arrows to hand can be an enormous help. The glove is another good one, as it increases your ranged damage making insta-kill headshots much easier. Once you have those out of the way, choose from the others according to your playstyle. Upgrading your breastplate increases your health points and is a no brainer, while a better bracer means more weapon damage. Tool upgrades mean more inventory, but you obviously shouldn’t bother with that if you haven’t unlocked abilities stored on the toolbelt, such as sleep dart, poison dart and firebomb. You’ll need a big stack of common, rare and legendary crafting materials to upgrade all your equipment. We strongly suggest dismantling all spare blue and purple weapons and shields until you have fully upgraded all your equipment, after which you can sell them for drachmae. This saves hunting around for cedarwood, bronze and iron at least, although you’ll still have to collect other materials for endgame upgrades. All common and rare crafting materials can be found in random drops in loot caches, or you can spend two ability points to unlock crafting materials for sale at general vendors if you have plenty of drachmae. Or you can just go out and get it yourself for free, of course. Here’s how to collect all the different resources. Cedarwood and bronze are common crafting materials most easily obtained by breaking down common or rare loot. Ranged weapons yield more cedarwood, while melee weapons and shields offer more bronze. If you want more, use Senu to track down enemies carrying shipments. Killing the marked guard will award you a stack of the marked material – but you’ll have to fight the escorts or do a runner. Iron is a rare crafting material. It can be obtained in exactly the same fashion as bronze and cedarwood – just look for the purple bordered icons on your map. It’s less frequently found than the other hard materials, so visit endgame areas for best results. Soft leather and hard leather are common crafting materials most easily obtained by hunting animals. Hard leather is dropped by crocodiles and hippopotamuses, whereas soft leather is on herbivores like gazelle and ibex as well as small predators like hyena. Birds do not drop leather. When roaming the landscape, equip a spear and smack down animals you pass for quick material farming – you don’t even have to dismount to pick up the drops. Doing this consistently will quickly build up a big store of materials. However, when you need lots of soft or hard leather, the easiest way is to go to animal lairs and kill everything, or use Senu to spot nearby animals you can chase down. Pelts are rare crafting materials dropped by large predators like lions and panthers. Obviously extracting them from their owners can be a bit dangerous, but late game areas are bursting with hungry cats to hunt, so you shouldn’t have too much trouble. All final upgrades require carbon crystal, a legendary material. Carbon crystal is found in treasure chests, especially in bandit camps and forts. Visit these locations and use Senu to locate them. It’s thin on the ground for a reason but if you clear Treasure points of interest thoroughly you’ll soon build up a stack. 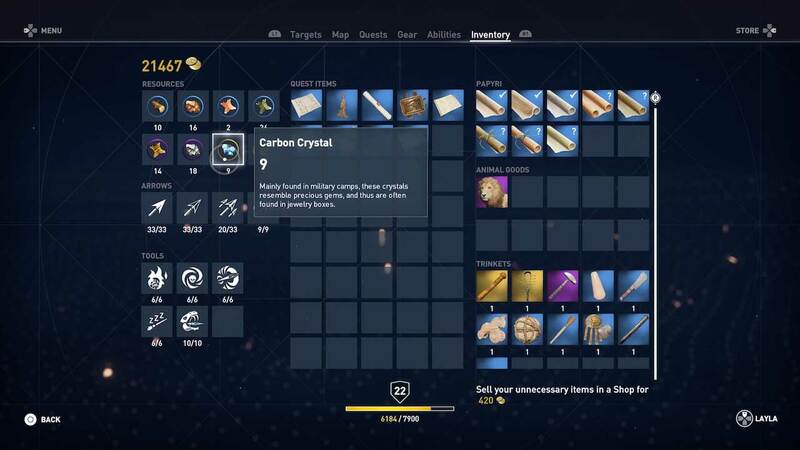 If you have plenty of drachmae, you can also buy carbon crystal from the nomad vendor, although there’s an inventory limit each day. Scan the world map for the teal mission icon to find this wandering vendor. In addition to crafting materials, you’ll find several other resources in your inventory as you progress through Assassin’s Creed Origins. Trinkets are just cash items; you don’t use them for anything at all. Sell them at any vendor for a handful of drachmae; there’s a D-pad shortcut to sell “unnecessary items” en masse, and you should do so. Animal trophies like hyena ears and heron feathers are likewise not used for anything – you just sell them for cash. There are some side quests that will ask you to collect particular animal trophies, but the good news is by the time you reach them you’ll be high level enough that every animal drops trophies, so don’t bother holding onto these. Seel them along with your trinkets using the “unnecessary items” shortcut key at any vendor. Silica, though, ah! Now we’re talking. Don’t sell this off: silica is a legendary resource used to access optional story content, and if you want to 100% Assassin’s Creed Origins you need a lot. We can’t talk about it any further without spoiling things, but other pages on this guide detail it – don’t worry. Silica is found in tombs, like the pyramids and other Old Kingdom monuments and structures, and is frequently just lying in the environment. Hold Up on the D-pad to highlight nearby loot items to find it, and look out for its orange glow. We have a list of every tomb in Assassin’s Creed Origins for silica hunting, although it does feature some slight, location name spoilers. 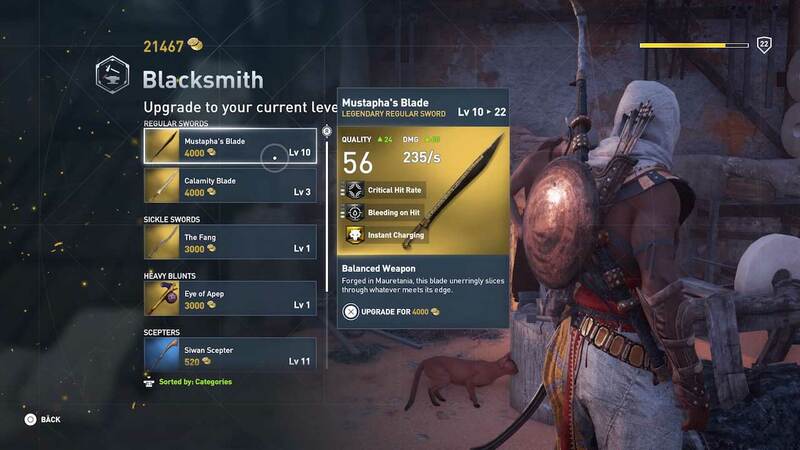 There are several melee weapon types in Assassin’s Creed Origins, and each has its own moveset and adrenaline (Overpower) attack. Play around with them all and see which ones you like using. If you enjoy chaotic play and have invested in the Warrior end of the skill tree, you’ll want to unlock to carry two melee weapons and switch between them at will, so you’ve got a heavy weapon to bash through tower shields and something more suited to crowd control. The default weapon choice, with medium speed and medium damage. The two categories have different overpower attacks. Useful in almost any situation. You can move around freely while you charge heavy attacks, which is great. A decent all round weapon with medium range and quick attacks, but not quite as damaging as swords and won’t hack through shields. Builds adrenaline very quickly via combo multipliers, and has a rage mode Overpower which refreshes very quickly. You can charge your heavy attack while moving. Very fast, but with short reach; you’ll want to be good at positioning and dodging, and avoid big crowds. No good against agile, dodging enemies who scamper out of reach. Like swords, you can move freely as your charge your heavy attack. The Overpower knocks enemies to the ground and is a little underwhelming. Both slow but extremely powerful and good at staggering heavily defended enemies. It’s hard to hit more agile enemies, though. Consider keeping one in your off-hand to switch to after knocking a foe down a charged heavy attack. Mind the axe’s charged heavy attack, which includes a quick shove backwards that can deflect incoming blows; it’s neat. The longest reach of any weapon type and reasonably quick, but does bugger all damage against heavy enemies. Very good for keeping a crowd pr agile enemies under control as you move into a better position, but definitely not a main weapon choice when it comes to boss battles. The heavy charged attack is a forward dash and can be hard to land successfully. If you like using bows at all, you should immediately start spending ability points to unlock the second bow slot. Bows come in four different varieties, and are variously weighted towards chaotic conflict or stealth play – so you’ll want one for both situations, probably. Here’s a hot tip: each bow category has its own ammo pool, so if things go pear shaped and you empty your quiver, just open your inventory and equip a different category of bow for a fresh supply. Don’t forget to switch back and to refill your ammo supplies when things settle down. The pure stealth option, predator bows have a very shallow ammo pool but do extreme damage. They have a unique reticule aiming system which is a little trickier than the auto-aim on other bow types, so give yourself time to aim and attack from cover. If you like this style of bow, upgrade your quiver as a priority and check out the Hunter end of the skill tree for some neat abilities. A compromise option, hunter bows can be fired quickly enough for use in open conflict, but do way more damage if you draw them back fully, which is most easily achieved in stealth. Not as damaging as predator bows. The ancient shotgun, warrior bows fire multiple projectiles at once. The spread on the arrows is huge so you really want to use them at close range, and invest in the upgrade that reduces spread if you draw fully. Not that great, if we’re honest, except against big heavy solos and easily headshot pursuing animals like hippos and crocodiles. Low damage but rapid firing, light bows are perfect for peppering your enemies in open conflict. Equip one, lock on, and ping away at a hippo’s head as it rush towards you. You might get away with it! Shields are extremely straight forward. Equip the best one you have, with lots of bonus attributes if possible. Remember to use the block button. Shields won’t protect you against heavy attacks, though, so remember the dodge command, too. There’s nothing else to say here.